The London Review Bookshop is offering a special opportunity to purchase a limited first edition of Sweet Tooth, signed before publication by the author and published in association with Jonathan Cape. 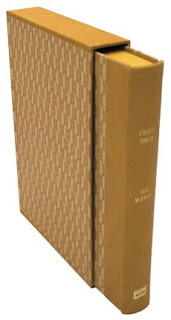 The edition comprises 100 copies, seventy-five of which have been quarterbound in Harmatan Yellow 30 fine leather with letterpress patterned sides on Mohawk Loop Ginger paper, numbered 1 to 75, and twenty-five copies fully bound in the same leather, numbered i to xxv. All copies have Bugra Brown endpapers, coloured tops, head and tail bands and Dubletta-lined slipcases. You may order as many copies as you wish but any multiple orders will be reviewed on 31 August and, if necessary, scaled down accordingly. Please indicate whether, if your preferred edition is unavailable, you would like to receive the other edition. Books will be sent by Special Delivery in the UK (please add £7.55 per book) and by International Signed to Europe (add £15.57 per book) and Rest of the World (add £21.83 per book).